35 personalities currently on file. Occupation: Searga, Kriar Military. Consultant for the Protectorate. Legal counsel licensed in the 1st and 4th Alliance territories, the Trade Union, The 27th Magiocracy of the Ring Realms, Ivaneth, Corwin, and Eastern Silissia., Special "consultant" to Isis. Consort to Lady Drucilla Frielos. Mage for hire. Private detective. Unusual Features: Annawen possesses the attributes typical to Kriar (but unusual to humans) these include greater tissue density, ocher-gold skin, and dark black eyes that appear (when observed closely) to have stars in them. Auburn is an extremely rare hair color for members of the Kriar species. Annawen is spirit-bonded with her sister Cassin and the two of them share mingled thoughts. As a side-affect of their relationship Annawen never speaks aloud even though she is fully capable of speaking. In periods of extreme stress or when communication is otherwise impossible, she will speak aloud. Annawen is extremely dependent on her sister, and if separated from her for more than a month she becomes snappish and irritable. After three months she slips into a depression and becomes non-responsive. The severity of this dependence has been lessened since her engagement to Drucilla Frielos, who is also a twin. Interestingly enough, Drucilla is the silent member of her pairing. Drucilla and Annawen speak aloud to each other at times in their own private language. Since becoming married Annawen has acquired the ability to shapeshift from Drucilla. Group Affiliations: The Protectorate Time Authority, Kriar Military, Kriar Counsel, Cosmodarus Counsel of Mages, House Frielos, House Ishtarvariku, House Felspar, the legal boards of the 1st and 4th Alliances and the Trade Union. Advocate and litigation tricksters guilds of Ivaneth, Corwin, and Eastern Silissia. Magical Skills: Annawen is an extremely gifted mage able to cast with exceptional power. Her skills are approaching those of an arch-magi but it will be some years yet before she reaches that level due to her extremely diversified interests. Because Annawen has Kriar combat level power matrixes, she can tap into their energy to boost her spells even further. Her training in Kriar warp-science, and the math-array conditioning of her mind make her able to "twist" magic in a way that even great elders cannot match. For all its power and diversity, Annawen's magic is severely flawed in as much as she lacks control. She can easily cast spells too strong for her manipulative abilities. She often requires the presence of Cassin who has far weaker magic but extraordinary control. Working together they are a match for mages far more skilled. Annawen originally apprenticed for her Mother Dorian, but later caught the eye of Gabriella Sarn Ariok who saw her extraordinary potential. Tournament Rank: Annawen does not compete in tournament play. She has spent a number of years training martially in the Kriar military. The durability of her body, coupled with combat enhanced reflexes and strength, makes her extremely dangerous even unarmed. Her current skills as a warrior are roughly equivalent to a 10th rank fighter. However, with the ability to boost her energy levels and percieve through time, she can easily compete at the unlimited combat level. Information: Annawen is the silent sister to Cassin. The two sisters are as different from one another as they are alike. Where Cassin represents restraint, logic, and intellect, Annawen represents hedonism, creativity, and passion. Annawen is extremely promiscuous, outgoing, and spontaneous. While Cassin plans things down to the last detail, Annawen simply makes it up as she goes. Each sister represents the pure forms of the extremes that might occur in a normal personality. This is why Annawen is so good a magic. It is a skill that requires confidence, the slightest shred of doubt can ruin or cripple a spell. Annawen literally has no worries, and no fear or compunction about the consequence of her actions. By that token, she has nothing holding her back. This is, of course, why she has problems with control. Though law and rules are not the kind of thing Annawen would normally like, she finds the idea of twisting rules to her own ends intriguing. Her creative and exhibitionistic nature are extremely well suited to both a courtroom and the stage. She would be perfectly suited to them except for the fact that does not speak aloud. This of course, keeps her out of trial law in all but the most sophisticated territories where telepathy is tolerated as a means of communication. She does on occasion call on Cassin to be her "voice" as she is in most of their everyday life. Cassin typically refuses most of her sister's requests because she feels Annawen should "find her own voice". Being the eldest, they are the big sisters to all the Felspar family children. They are often bailing their brothers and sisters out of trouble. Annawen's interest in law is quite valuable for resolving many of the situations that arise. Annawen feels that Cassin is an errant part of her that has run away. The fact that she cannot function overlong without her troubles her. She harbors a secret (not so secret to her sister) desire for them to unify into one person. Cassin is extremely bothered by this desire in her sister-- likening it to being "consumed". Despite their oppositeness, they are as close as two sisters can be an NOT be one person. Becoming married to Sindra and Drucilla Felspar has been an extremely satisfying experience for Annawen. Her pairing with Drucilla provides a balance in her life that Cassin was unable to provide. The Frielos twins as specialists too, but it is not along the right-brain left-brain aspects. Drucilla represents the passive aspect of their pairing (to Sindra's aggressive) which is well suited to Annawen's personality and tendencies. As can be evidenced in their occupations and group affiliations, Cassin and Annawen are extremely active and well traveled. They are adored on Homeworld. Elsewhere they are regarded with respect, and in many cases with fear and suspicion. Elsbeth Crowninshield considers the twins, and Annawen in particular, two of the greatest threats to the integrity of magic. Despite herself, Elsbeth has been unable to view these two as enemies though they embody the very essence of what she fears (the merger of magic and technology). Whether by luck, or through their empathy, the twins knew it was essential to make sure they became close to this elder elite. A campaign several years in the making got them into the good graces of the red-haired woman buying them safety from her war on technology. Occupation: Searga, Kriar Military. Consultant for the Protectorate. Mathmatician, Engineer, Consort to Lady Sindra Frielos. Unusual Features: Cassin possesses the attributes typical to Kriar (but unusual to humans) these include greater tissue density, ocher-gold skin, and dark black eyes that appear (when observed closely) to have stars in them. Auburn is an extremely rare hair color for members of the Kriar species. Cassin is spirit-bonded with her sister Annawen and the two of them share mingled thoughts. As a side-affect of their relationship, Cassin tends to function as Annawen's "voice". Of the two sisters, Cassin is fairly autonomous, she can get along without her sister without experiencing any disability. This fact annoys Annawen who feels Cassin should be as dependent on her as she is on Cassin. It is likely that Cassin is dependent on her sister but her self control and focus are magnitudes greater than Annawen's. Cassin is as introverted as Annawen is extroverted. As Annawen says, "She would never come out from under her rock, if not for her." This is, in essence true, as Cassin is fairly satisfied to stay by herself tinkering with gadgets, reading Kriar Science Digest, and exploring the Homeworld cybernet. Since her marriage to Sindra, Cassin has become more out going and less inwardly focused. Like her sister, shortly after their marriage Cassin acquired the ability to shape shift. Group Affiliations: The Protectorate Time Authority, Kriar Military, Kriar Counsel, the Kriar Engineering and Manufacturing counsel, Techstar Enterprise Group, Cosmodarus Counsel of Mages, House Frielos, House Ishtarvariku, House Felspar. Magical Skills: Unlike her sister Annawen, Cassin is rather challenged by magic. She is always concerned with consequences and preoccupied with control. As a result, her magic suffers for lack of confidence. What magic she can perform is done extremely well and with exceptional accuracy and control. Cassin is an Engineer at heart and her understanding of the physics and fundaments behind the magic give her a refined sense of is parameters and side-affects. It is the fact that she, as Gabriella says, "Reduces all of her magic to a blasted math equation" that prevents her from being a better mage. It was in fact, Gabriella's statement that sparked Cassin to research and develop a mathematical language and expression syntax for representing magic. It was through this new language that she dubbed "Magiocentric Calculus" that Cassin became in high demand to high order mages. By reducing spells to this math, Cassin can manipulate them mathematically to come up with spell "vectors" and "reciprocals" which are extremely valued in the enterprise of magic item creation and in the development of new spells and wards. Cassin astonished the court of Isis in a display where she was able to create a new spell simply by combining the spell equations into a new form. As an advent of her reducing magic to this math she can manipulate magic far in excess of her understanding. She is often called upon to telepathically join with a higher order mage to serve as a magical "calculator" being able to see the magic and determine the relative coherence of the energies at work. Tournament Rank: Cassin is more concerned with battle (and practically everything else) than Annawen. As an act of discipline and training Cassin has competed in a few tournaments as experiments. She "held back" and did not use all of her Kriar augmentations. Even without she placed in the final rounds of the 12th rank. With her years martial training in the Kriar military, and using all of her augmentations she could have easily ranked in the unlimited class. Information: Cassin is the steadfast twin of the union. She represents all the things that Annawen is not. She is steady, logical, and dedicated to rational thought. Cassin is extremely close to her Mother (Foathra) Dorian. Dorian is Cassin's paternal progenitor. Early in her life, Dorian was in fact Gondor (a man) and engaged to Cassandra Kel'Ishtauri. A extremely unfortunate encounter with a vampire and a the humor of a Loki resulted in a man being placed in woman's body. By shape changing, he could regain his normal male form, but the magic would eventually wear off and he would again become "Dorian". It was in his shape changed state that Dorian (Gondor) fathered the twins Cassin and Annawen. As a way of keeping things from getting confused-- they coined the term "Foathra" for a female that had sired children. There are other Foathrings in the Felspar family, but Cassin and Annawen were the first. Initially, Cassandra thought she could deal with her husband to be having become female but later found she couldn't handle it. Gondor also had problems having thought like a male for 50 odd years, now being a female-- and via hormones beginning to think like a female. The two of them grew apart but raised Cassin and Annawen as a family. Cassin married Sindra by "default". She thought the pairing with the Frielos twins was a bad and unsafe endeavor. Only later did she come to really appreciate the benefits of being spoiled by an elder. Now, many years into the marriage, she has fully embraced their relationship and enjoys all of its benefits. Cassin plays the passive role to Sindra's aggressive one, and is content to satisfy the needs of her sometimes demanding mate. Cassin is much more involved in technology and more technically savvy than her sister. In that aspect, she complements her sister well, who is extremely magic saavy. Working together the twins can excell in practically any culture. Unusual Features: After millennia of lyonization (age rejuvenation) and countless wars and battles, much the Supreme Magistrix's body is synthetic. To assist in spell casting and in making her resistance to many forms of energy a significant portion of her bone marrow has been replaced with an energy absorbtive polymer alloy that is both flexible and resilient. Additionally, her subdermis has been laced with a lattice of carbon fibres. 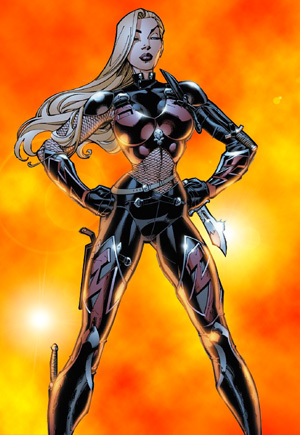 She has had many physical augmentations that increase her strength, endurance, and reaction times. She is essentially a organism designed (and psychologically suited to) for war. As a result of all these alterations of her body she is significantly denser and more heavy than a human of her size and build. Magical Skills: Aarlen is a grand loremage of extraordinary power specializing in war-magic and mind control. She is what is deemed in the realms as a technomancer, a mage who can intertwine magic and technology. As such, her magic is rivaled only by beings of cosmic power such as the pantheon lords and the Eternals, and even THEY are careful with her. Tournament Rank: Aarlen trains both magically and martially. She is an unlimited class competitor that only fights in the ranks reserved for great elders. Information: Supreme Magistrix of the 4th Alliance territories. Engaged to Regaura Targallae. Aarlen's exact age is unknown (even to her) but historians agree that she can be no less than 45,000 cycles old. This member of the grand elder elite is descended from Territaani branch of humanoid stock. Aarlen was magically and technically enhanced by her Father in order to create a living weapon. Abused and tortured throughout her childhood, she eventually turned on her Father who had already killed her mother and sister. Unfortunately for the then twelve cycle old Aarlen, the cycle of violence did not end there. Mishap, misfortune, and aggression over a span of years eventually turned the white-haired woman into a brutal killing machine. She became proficient in all the major martial and magical arts, and mastered many forms. The a millenniums long series of bloody conquests she hacked out the territory of space now known as the fourth alliance. Unusual Features: Like their mother, Sindra and Drucilla have been extensively modified. They no longer age and are resiliant to most forms of low grade injury (knives, blunt traumas). Magical Skills: Sindra and her sister Drucilla are what Aarlen refers to as "lazy mages". They would be extraordinarily powerful given their physical and mental gifts but simply don't want to be bothered with the discipline. Lazy or not, there is no mortal mage that can even hope to match their full strength. Each of them possesses grand-loremage level magic it simply isn't backed up with the additional learning one would expect of arcanists of their calibre. 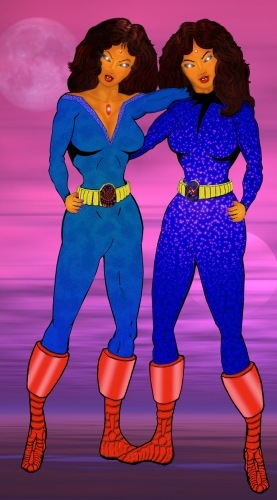 Tournament Rank: Sindra and Drucilla, when they so desire it can be fiendishly powerful opponents. With the ability to increase their strength and speed, and additionally "overdrive" their bodies for short periods they have truly brutal combat capacity. Trained as assassins, they have extensive knowledge of anatomy and know every vital nerve center, muscle, and ligament. While they have great strength they rarely need to use it. They tend to use their size and mass to cow weaker opponents and simply avoid fights all together. When pressed they are trained in practically every form of hand weapon and polearm and wield them at 14th circle capacity. Information: Daughter of Aarlen Frielos. Elder elite and member of the D'klace guild of assassins. Being "into" everything, she even plays in an all-girl musical group with Luthice and Arabella. She is the speaking sister to Drucilla Frielos. Something to note about Sindra and her sister is the fact that while they are to a certain extent evil, and definitely self serving, these two never became the unredeemable black that many of Aarlen's creations became. This seems to be a deliberate happenstance on Aarlen's part, presumably so that they would be more effective as spies and seductresses. Sindra is married to Cassin Kel'Ishtauri Felspar. Being the "voices" of the two sets of twins its not uncommon to see them paired with the other twin. Why they didn't simply marry that way is still something of a mystery.